Email marketing is a great way to welcome subscribers, nurture relationships with them, build trust and engage them. While writing a letter never grows old, emails have taken over the concept of sending both personal and professional messages to make communication quick and immediate. The average number of emails sent and received on a daily basis has reached 269 billion. This statistic is enough to tell you the potential of an email. With the right choice of marketing channels, brands can not only chance upon the right set of target audience but also improve their chances of converting prospects into customers. Email marketing is the choicest channel to build awareness, grab attention and convert prospects. It helps you segment your marketing content, reach out individually and personalize your communication based on your relationship with the recipient. Brand recognition is "the extent to which the general public (or an organization's target market) is able to identify a brand by its attributes." So when you send out emails to your subscribers, make sure to include your brand's logo and other visual signifiers in the email. The brand colors and graphics should be consistent in every email sent out, in order to help the audience instantly recognize an email sent out by your company. The brand attributes lead to increased awareness, which in turn attracts customers towards your brand's products and services. If they need to pick between two brands for the same product -- one they recognize, the other they've never heard of -- you can count on them picking the one they know. The emails that can improve brand recognition include newsletters. A newsletter updates your customer on the current happenings and upcoming events and helps the brand stay top of mind with the customers. This newsletter by Booz Allen Hamilton Inc. offers analytical insights to the recipients. It keeps the recipients updated on the latest happenings in the industry. There is an option to update your preferences so that you receive content that you are interested in. It is an excellent way to improve brand recognition. Customer retention focuses on strategies that help companies retain as many customers as possible for as long as possible. You certainly don't want to be a one-time purchase for your customer. Ideally, you want them to be loyal customers. A good email marketing strategy can get you there. If you send out the right type of emails at the right time with the right frequency, your customers will keep coming back to you. It is also possible that they become your brand advocates, taking it upon themselves to market your business for you. When you send out an email, you remind your audience of your existence. These emails can be alerts informing them about new products or telling them about an ongoing sale. These emails are gentle reminders; you should send them to your subscribers frequently. Even when your subscribers are not invested in you, they will be reminded that you exist. When the times come that they are ready to buy a certain product/service offered by you, your brand will be part of their consideration. These emails could convert a "chance meeting" into a sale. Send out "Haven't seen you in a long time" emails or re-engagement emails to your customers to improve retention and get them back. If you are in a business that requires them to re-order products, you can send out re-order emails to retain the customer. This will show them you care. 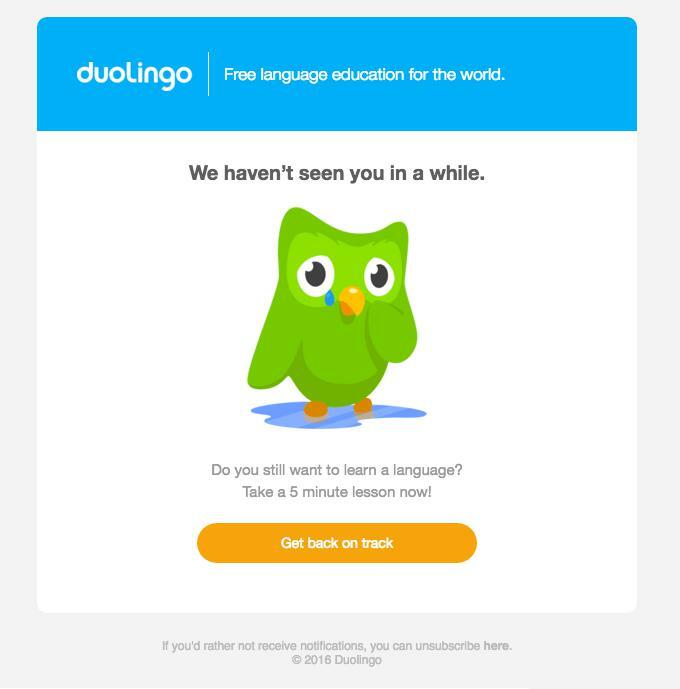 Sending out an email similar to the one sent by DuoLingo can help you increase conversion and retention. As a brand, your email marketing should showcase what you have achieved, and how well you know your industry. Offering valuable tips, sizeable information and even content that your audience requires at the moment can help you establish authority, which in turn improves your brand's value. If your email adds value, chances are that it will be forwarded to more people thus spreading good things about your brand. Send them product information or specifications about the product they are considering to buy. You can even send them industry news if you want to establish authority. The email by Haworth offers a detailed overview of the products offered by them. When you trust someone, entering into a relationship with them becomes a lot easier. The same is true for those prospects who are evaluating your brand. For you to win their trust, you should ideally invest in communicating with them and connecting with them about the right things. Email marketing can help you do that with ease. Whether it is a new subscriber or someone who is already on-board as a customer, the emails that you send will help them get to know you better and eventually trust you. Emails help nurture relationships. Welcome emails, as well as lead nurturing emails, can help foster relationships. They help the prospect onboard your brand and learn everything they want to, before moving from awareness to consideration stage. This email by Allrecipes welcomes the subscriber. The brand asks the subscribers to send in their preferences and, accordingly, curates the recipes for them. The CTA allows the customer to set their taste preferences. Your existing brand guidelines should be applied to your email marketing strategy as well in order to attract the right people. Your email's tone and voice should be consistent with your marketing communication for the right effect. If you are a serious brand, for example, your email communication should convey it. The content of the email is an important aspect and should be planned in advance. If you are strategizing your email marketing, make sure you have set forth a plan for the content. The content should be aligned with the type of email that is being sent to the customer. For example, if you are nurturing a lead in the consideration stage, the email content would differ from the content that is included in the welcome email. The content should be concise and crisp and such that the reader gets complete information at a glance. The subject line should convey what the email contains. Keep it simple and attractive. The content should offer value to the readers and should provide insights to the users. It is important to write an actionable email. If your prospect is learning about your brand, try taking them to the website. If your prospect is in the consideration stage, the content and the CTA should compel them to buy. Adding appropriate CTAs will help with conversions. Never send an email without the prospect's consent. Your brand may suffer if you send out an email to a prospect/customer who does not wish to receive emails from you. It is important to channel your marketing efforts in the right direction in order to build a consistent brand. Email marketing is a great way to welcome subscribers, nurture relationships with them, build trust and engage them. You should send out the right emails at the right time to attract attention and retain loyalty. It is also important to craft your email using standard practices to achieve your goals. So, next time you are planning to work on your branding, don't forget to optimize your email marketing strategy.